Visually analyze your HubSpot CRM data by creating insightful sales reports and dashboards. Gain 360-degree insight into your sales pipeline and sell more. Share reports and collaborate with your colleagues. Analyze and track key sales metrics. Be empowered. Your HubSpot CRM data gets seamlessly synced to Zoho Analytics. 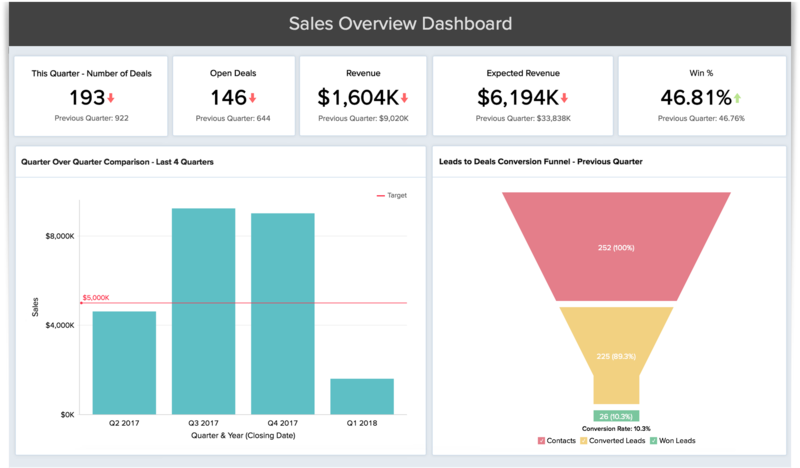 Access a fully featured BI tool to analyze your sales data in depth. Zoho Analytics' HubSpot CRM Connector provides you with more than 50 hand-picked, ready made reports & dashboards, that you'll love and find great value in instantly. Combine data from different sources and create cross functional reports. For example, combine your marketing spend data in Excel files and sales data in CRM to create a spend vs sales report. Develop reports together with your colleagues, and collaboratively analyze them for informed decision making. Reports and dashboards can be scheduled for emailing or can be exported into a variety of file formats for offline access. "We use Zoho Analytics for generating Sales and Attrition reports. This allows us to track our salespeople and figure out who is performing best, and at which rate they are increasing their monthly sales." Visualize your business data today.